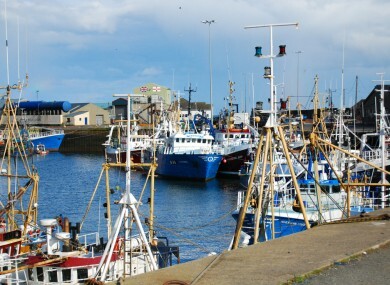 The harbour in Kilkeel, Co Down. TWO MEN HAVE been arrested in Co Down after a motorist was assaulted in a terrifying ordeal in which two men wearing hi-vis jackets hijacked his car. The incident happened in the early hours of Friday 19 May in the seaside town of Kilkeel. PSNI Detective Sergeant David Cameron said the 33-year-old victim was driving in the area when he was stopped by a ‘road closed’ sign and two men wearing the hi-vis jackets. “They proceeded to take the driver’s car keys and then assaulted him while he was in the passenger seat of the car. He was subjected to this ordeal while one of the men drove around with the other in the back seat,” Cameron said. The victim was then returned to the spot where his car was taken and he was left on the side of the road after his car and phone were taken by the men. The stolen car and phone were later recovered by police in east Belfast. Police in Newry subsequently arrested two men, aged 36 and 29, on suspicion of blackmail, hijacking, theft and false imprisonment. Email “Terrifying ordeal for driver after his car is hijacked by men in high-vis jackets at 'road closed' sign”. Feedback on “Terrifying ordeal for driver after his car is hijacked by men in high-vis jackets at 'road closed' sign”.